Premises: Approximately _____ square feet of Rentable Area located on the ______ floor of the Building, as shown on the Floor Plans attached to this Lease as Exhibit A. Term: ____ ( ) months from the Commencement Date. 1.1 Terms Defined. The following terms have the meanings set forth below. Certain other terms have the meanings set forth in the Basic Lease Information or elsewhere in this Lease. Alterations: Alterations, additions or other improvements to the Premises made by or on behalf of Tenant. Base Operating Expenses and Base Real Estate Taxes: The Operating Expenses and the Real Estate Taxes paid or incurred by Landlord in the Base Year. Building: The building consisting of ground floor retail and ___ floors of office use located on the Land, commonly known as ________________________. Mixed Use Complex: The Land, the Building, the Retail Complex, landscaping, paved walkways, driveways and all other improvements at any time located on the Land, and all appurtenances related thereto, commonly known as ______________. Escalation Rent: Tenant's Percentage Share of the total dollar increase, if any, in Operating Expenses and in Real Estate Taxes, each as paid or incurred by Landlord in each calendar year, or part thereof, after the Base Year, over the amount of Base Operating Expenses and Base Real Estate Taxes. 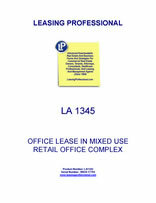 If the Building or the Retail Complex is less than ninety-five percent (95%) occupied during any part of any year (including the Base Year), Landlord shall make an appropriate adjustment of the variable components of Operating Expenses and Real Estate Taxes for that year, as reasonably determined by Landlord using sound accounting and management principles, to determine the amount of Operating Expenses and Real Estate Taxes that would have been incurred during such year if the Building and the Retail Complex had been ninety-five percent (95%) occupied during the entire year (and, if applicable, if the tenant improvements in the Building had been fully constructed and the Land, the Retail Complex, the Building, and all tenant improvements in the Building and the Retail Complex had been fully assessed for Real Estate Tax purposes). This amount shall be considered to have been the amount of Operating Expenses and Real Estate Taxes for that year. For purposes hereof, "variable components" include only those component expenses that are affected by variations in occupancy levels. Impositions: Taxes, assessments, charges, excises and levies, business taxes, licenses, permits, inspection and other authorization fees, transit development fees, assessments or charges for housing funds, service payments in lieu of taxes and any other fees or charges of any kind at any time levied, assessed, charged or imposed by any federal, state or local entity, (i) upon, measured by or reasonably attributable to the cost or value of Tenant's equipment, furniture, fixtures or other personal property located in the Premises, or the cost or value of any alterations, additions or other improvements to the Premises made by or on behalf of Tenant; (ii) upon, or measured by, any Rent payable hereunder, including any gross receipts tax; (iii) upon, with respect to or by reason of the development, possession, leasing, operation, management, maintenance, alteration, repair, use or occupancy by Tenant of the Premises, or any portion thereof; or (iv) upon this Lease transaction, or any document to which Tenant is a party creating or transferring any interest or estate in the Premises. Impositions do not include Real Estate Taxes, franchise, transfer, inheritance or capital stock taxes, or income taxes measured by the net income of Landlord from all sources, unless any such taxes are levied or assessed against Landlord as a substitute for, in whole or in part, any Imposition. Land: The parcel of land described on Exhibit B attached to this Lease. Operating Expenses: All costs of management, operation, maintenance and repair of the Mixed Use Complex, including, but not limited to, the following: (i) salaries, wages, benefits and other payroll expenses of employees engaged in the operation, maintenance or repair of the Mixed Use Complex; (ii) commercially reasonable property management fees and expenses; (iii) rent (or rental value) and expenses for Landlord's and any property manager's offices in the Mixed Use Complex; (iv) electricity, natural gas, water, waste disposal, sewer, heating, lighting, air conditioning and ventilating and other utilities; (v) janitorial, maintenance, security, life safety and other services, such as alarm service, window cleaning and elevator maintenance and uniforms for personnel providing services; (vi) repair and replacement, resurfacing or repaving of paved areas, sidewalks, curbs and gutters (except that any such work which constitutes a capital improvement shall be included in Operating Expenses in the manner provided in clause (xiv) below); (vii) landscaping, ground keeping, management, operation, and maintenance and repair of all public, private and park areas adjacent to the Building; (viii) materials, supplies, tools and rental equipment; (ix) license, permit and inspection fees and costs; (x) insurance premiums and costs (including an imputed insurance premium if Landlord self-insures, or a proportionate share if Landlord insures under a "blanket" policy), and the deductible portion of any insured loss under Landlord's insurance; (xi) sales, use and excise taxes; (xii) legal, accounting and other professional services for the Mixed Use Complex, including costs, fees and expenses of contesting the validity or applicability of any law, ordinance, rule, regulation or order relating to the Building; (xiii) rental costs of leased furniture, fixtures, and equipment; and (xiv) the cost of any capital improvements to the Mixed Use Complex made at any time to the Mixed Use Complex that are intended in Landlord's reasonable judgment as labor saving devices, or to reduce or eliminate other Operating Expenses or to effect other economies in the operation, maintenance, or management of the Mixed Use Complex, or that are necessary or appropriate in Landlord's judgment for the health and safety of occupants of the Mixed Use Complex, or that are required under any law, ordinance, rule, regulation or order which was not applicable to the Mixed Use Complex as of the Commencement Date, all amortized over the useful life or such other reasonable period as Landlord shall determine at the rate paid by Landlord on funds borrowed for the purpose of constructing or installing such capital improvements or at an imputed interest rate of eight percent (8%) per annum, as applicable. Operating Expenses shall not include: (A) Real Estate Taxes; (B) legal fees, brokers' commissions or other costs incurred in the negotiation, termination, or extension of leases or in proceedings involving a specific tenant; (C) depreciation; (D) interest, amortization or other payments on loans to Landlord except as a component of amortization as set forth above; (E) the cost of capital improvements, except as set forth above; (F) the wages and benefits of any employee who does not devote substantially all of his or her time to the Building unless such wages and benefits are prorated to reflect time spent on maintaining, securing, repairing, operating or managing the Building vis-a-vis time spent on matters unrelated to such activities; (G) costs paid to Landlord or to affiliates of Landlord for services in the Building to the extent the same materially exceed or would materially exceed the costs for such services if rendered by first class unaffiliated third parties on a competitive basis, and (H) salaries of personnel above the grade of senior property manager, senior controller, senior accountant and senior engineer. Subject to the provisions of this definition, the determination of Operating Expenses shall be made by Landlord in accordance with generally accepted accounting principles and practices consistently applied. The term "Operating Expenses" shall include the following: (i) ___% of Operating Expenses, as defined above, paid with respect to or fairly allocated to the office portion of the Building, (ii) ____% of Operating Expenses, as defined above, paid with respect to or fairly allocated to the common area portion of the Building, and (iii) ____% of Operating Expenses, as defined above, paid with respect to or fairly allocated to the Retail Complex. The foregoing percentages shall be equitably recalculated if at any time during the Term the square footage of the improvements owned by Landlord on the Mixed Use Complex changes, including a change in the square footage of the improvements owned by Landlord resulting from a sale of the improvements within the Land (for example, if Landlord were to sell the theatre located within the Retail Complex). Real Estate Taxes: _____% of all taxes, assessments and charges now or hereafter levied or assessed upon, or with respect to, the Mixed Use Complex or any portion thereof, or any personal property of Landlord used in the operation thereof or located therein, or Landlord's interest in the Mixed Use Complex or such personal property, by any federal, state or local entity, including: (i) all real property taxes and general and special assessments; (ii) charges, fees or assessments for transit, housing, day care, open space, art, police, fire or other governmental services or benefits to the Mixed Use Complex; (iii) service payments in lieu of taxes; (iv) any tax, fee or excise on the use or occupancy of any part of the Mixed Use Complex, or on rent for space in the Mixed Use Complex; (v) any other tax, fee or excise, however described, that may be levied or assessed as a substitute for, or as an addition to, in whole or in part, any other Real Estate Taxes; and (vi) reasonable fees and expenses, including those of consultants or attorneys, incurred in connection with proceedings to contest, determine or reduce Real Estate Taxes. Real Estate Taxes do not include: (A) franchise, transfer, inheritance or capital stock taxes, or income taxes measured by the net income of Landlord from all sources, unless any such taxes are levied or assessed against Landlord as a substitute for, in whole or in part, any Real Estate Tax; (B) Impositions and all similar amounts payable by tenants of the Mixed Use Complex under their leases; and (C) penalties, fines, interest or charges due for late payment of Real Estate Taxes by Landlord. If any Real Estate Taxes are payable, or may at the option of the taxpayer be paid, in installments, such Real Estate Taxes shall, together with any interest that would otherwise be payable with such installment, be deemed to have been paid in installments, amortized over the maximum time period allowed by applicable law. Rent: Base Rent, Escalation Rent and all other additional charges and amounts payable by Tenant in accordance with this Lease. Rentable Area: As to the floor leased entirely by Tenant, the sum of (i) all areas within exterior permanent Building walls measured to the inside glass surface of outer Building walls as specified in ANZI/BOMA 1996 Standards, including restrooms, janitor, telephone and electrical closets, mechanical areas, and columns and projections necessary to the Building, but excluding public stairs, elevator shafts and pipe shafts plus (ii) Tenant's pro rata share of Building Common Areas. "Building Common Area" shall mean the total area of the lobby of the Building and the total area on a floor consisting of restrooms, janitor, telephone and electrical closets, mechanical areas and public corridors providing access to tenant space on such floor, but excluding public stairs, elevator shafts and pipe shafts. Retail Complex: The retail center located on the Land. Tenant's Percentage Share: The percentage figure specified in the Basic Lease Information. Landlord and Tenant acknowledge that Tenant's Percentage Share has been obtained by dividing the Rentable Area of the Premises, as specified in the Basic Lease Information by the total Rentable Area of the Building, and multiplying such quotient by one hundred (100). In the event Tenant's Percentage Share is changed during a calendar year by reason of a change in the Rentable Area of the Premises or a change in the total Rentable Area of the Building, Tenant's Percentage Share shall thereafter mean the result obtained by dividing the then Rentable Area of the Premises by the then total Rentable Area of the Building and multiplying such quotient by one hundred (100). For the purposes of determining Tenant's Percentage Share of Escalation Rent, Tenant's Percentage Share shall be determined on the basis of the number of days during such calendar year at each such Percentage Share. Term: The period from the Commencement Date to the Expiration Date. 1.2 Effect of Certain Defined Terms. The parties acknowledge that the Rentable Area of the Premises and the Building have been finally determined by the parties as part of this Lease for all purposes, including the calculation of Tenant's Percentage Share and will not, except as otherwise provided in this Lease, be changed. 2.1 Premises. Landlord leases to Tenant and Tenant leases from Landlord the Premises, together with the non-exclusive right to use, in common with others, the lobbies, entrances, stairs, elevators, plazas, pedestrian walkways, restrooms, and other public portions of the Building, all subject to the terms, covenants and conditions set forth in this Lease. All the windows and exterior walls of the Premises, the terraces adjacent to the Premises, if any, and any space in the Premises used for shafts, columns, projections, stacks, pipes, conduits, ducts, electric utilities, sinks or other Building facilities, and the use thereof and access thereto through the Premises for the purposes of management, operation, maintenance and repairs, are reserved to Landlord. 2.2 Roof Antenna/Dish. Subject to Tenant's compliance (at Tenant's sole cost and expense) with all applicable Laws, and subject to Tenant obtaining Landlord's prior written consent, which shall not be unreasonably withheld, Tenant shall have the right to elect, by delivery of written notice to Landlord, to install, at Tenant's sole cost and expense, an antenna or satellite dish on the roof of the Building in a location determined by Landlord in its sole discretion (the "Dish"). Tenant shall be solely responsible for the installation, insurance, maintenance and repair of the Dish and the repair of any damage to the roof of the Building caused by Tenant's use, installation or maintenance of the Dish. The Dish shall be of reasonable size and design so as not to materially and adversely affect the Building structure, loading, systems or aesthetics. Tenant's use and installation of the Dish shall not interfere with the use of antennas or satellite dishes by other tenants of the Building. The Dish may be installed only after the acquisition by Tenant of all appropriate permits, consents and licenses. The provisions of this Lease regarding Alterations shall apply as if the installation of the Dish were a Tenant Alteration.